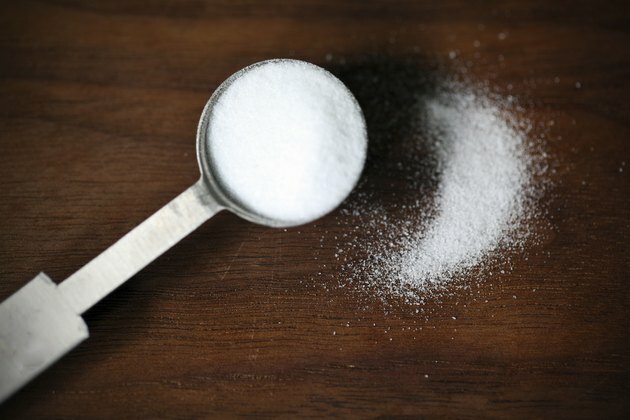 What Are the Health Benefits of Baking Soda for Digestion? Painful digestive problems that strike after a heavy or spicy meal can make you miserable. If you want fast relief, but don't have any over-the-counter antacids on hand, check your pantry for a box of baking soda. Known scientifically as sodium bicarbonate, baking soda is an inexpensive and effective home remedy that you can use to control occasional indigestion or heartburn. If you're on a sodium-restricted diet, consult your doctor before using baking soda to treat problems with your digestion. Indigestion, known medically as dyspepsia, is a collective term for a variety of symptoms, including the feeling of fulness before a meal, bothersome fullness after a meal, nausea, bloating and burning or pain between the lower end of your chest bone and navel. Indigestion is quite common among adults and can occur only once in awhile or as frequently as every day, according to the National Institute of Health's National Digestive Diseases Information Clearinghouse. Baking soda helps to break down fatty substances and food particles, making them easier to digest and calming the turmoil in your stomach. Heartburn, also known as acid reflux, is a burning feeling just below, or behind, your breastbone that spreads up to your esophagus. The unpleasant, burning sensation occurs when the band of muscle at the end of your esophagus doesn't close tightly enough, allowing stomach acid and partially digested food to creep back up into your throat. Almost everyone experiences heartburn at one time or another, which may be made more severe by hiatal hernias, pregnancies or certain medications. Baking soda neutralizes the excess acid in your stomach, putting out the flaming feeling in your chest and throat. See your doctor if you experience severe heartburn more than twice a week; you may be suffering from gastroesophageal reflux disease or GERD. Using baking soda to treat digestive problems such as indigestion and heartburn is as simple as mixing 1 rounded teaspoon of baking soda into an 8-ounce glass of warm tap water. Stir vigorously until all of the baking soda dissolves and quickly drink the mixture. If your digestive problems continue or return, you can drink this baking soda and water mixture every two hours until the discomfort passes. While baking soda is a typically safe and effective home remedy for common digestive problems, it's not for everyone. Because baking soda contains a lot of sodium, you should consult your doctor before using it as a treatment for indigestion and heartburn if you're over 60 or have high blood pressure. Also, baking soda isn't intended to be a long-term solution for persistent digestive difficulties. Avoid using baking soda continuously for more than a week.